Learning.com’s two Digital Literacy Assessment resources are designed to assess student skills across all ISTE Standards for Students at the fifth and eighth grade levels. The assessments are accessed and completed online using a customized testing interface on the Learning.com website, and each assessment is created at a level appropriate for the target audience. The assessments use technology-enhanced questions that meet Web Content Accessibility Guidelines and are responsive for use across devices. Practice tests, real-time data and teacher resources are also integrated into this resource. Digital assessments of foundational technology skills for students. Tests available for fifth and eighth grade levels. Includes teacher management features, sample tests and student preparation curriculum. 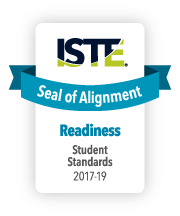 The Learning.com Digital Literacy Assessments successfully underwent the International Society for Technology in Education (ISTE) Seal of Alignment review for Readiness. Reviewers determined this resource helps build foundational technology skills needed to support the ISTE Standards for Students.